We’d love your help. Let us know what’s wrong with this preview of The Member of the Wedding by Carson McCullers. An alternate-cover edition for this ISBN can be found here. The novel that became an award-winning play and a major motion picture and that has charmed generations of readers, Carson McCullers’s classic The Member of the Wedding is now available in small- format trade paperback for the first time. Here is the story of the inimitable twelve-year-old Frankie, who is utterly, An alternate-cover edition for this ISBN can be found here. To ask other readers questions about The Member of the Wedding, please sign up. Is this a clean book in terms of subject matter and contexto? Mel Of course it is. A great view into what life was like in the South (USA) 1940-50's. As my reading tastes expand, I attempt to read books by women authors from across the globe, both contemporary and classic. My reading journey until now had never included the work of Carson McCullers, even though my mother has been urging me to read her books for years. When a few friends from the reading for pleasure group said that they were doing a buddy read of McCullers' Member of a Wedding, I was pushed to join them. While not as highly regarded as her definitive work The Heart is a Lonel As my reading tastes expand, I attempt to read books by women authors from across the globe, both contemporary and classic. My reading journey until now had never included the work of Carson McCullers, even though my mother has been urging me to read her books for years. When a few friends from the reading for pleasure group said that they were doing a buddy read of McCullers' Member of a Wedding, I was pushed to join them. While not as highly regarded as her definitive work The Heart is a Lonely Hunter, Member of a Wedding is McCullers' tale of coming of age in the south in the 1940s, a story of a misfit girl in need of guidance to navigate the world. This touching story has generated many discussions in our buddy read and one that I am grateful to have joined. Frankie Addams is twelve years old and has grown up in an unnamed rural community in Georgia. She reminds me of an older Scout Finch, yet less informed before her father is for the most part absent from her life. Like Scout, Frankie comes from a family where her mother died in childbirth, leaving her father a widower who never remarries. It is up to the family's colored housekeeper Berenice to guide Frankie through her childhood, and, while Berenice is always around to provide hugs and cookies, she has left Frankie largely unaware of the world at large. At the cusp of puberty, Frankie remains naïve to the changes about to happen to her and still runs wild with her younger cousin John Henry West. Having no female friends or family members to teach her about the birds and the bees, Frankie is perfectly cast as the town's misfit, while Berenice prays that a girl best friend enters her life sooner than later. It is in this context that we meet twelve year old Frankie in the August of her brother's wedding as she plots to leave her home and join her brother on a worldwide adventure through life. She tells her father and Berenice and anyone who will listen that when the family goes to the wedding in Winter Hill, that she will not be coming back. Naturally because her brother's name is Jarvis and his bride to be is named Janice, Frankie decides to call herself Jasmine, making her a natural member of the JA club. She believes that Jarvis and Janice will adopt her and take her with them wherever they go, making her a member of their wedding. This plotting leads Frankie to buy a lewd dress for the occasion that John Henry dubs a Christmas tree and has her gallivanting through town on adventures as she is restless and has no adult guidance in her life. While Berenice teases her for her choice of gown, she does little to stop Frankie from exploring her community, even when she is on the verge of grave danger. The father just nods when Frankie says she is not coming back, because either he does not believe this to be true, or he is so removed from his daughter's life that he does not know what goes on at his home on a daily basis. With the home life being what it was, I almost wanted Frankie to leave town, even though I knew that this was not a feasible possibility. McCullers can flat out write. Her style is simple and soothing that has the reader reeled in from the opening paragraphs. Yet, the writing is also insightful as she creates multi layered characters and creates a place for them in the world at large. In many meaningful exchanges between Frankie and Berenice, McCullers has Frankie asking her housekeeper if the reason why she does not have many opportunities available before her is due to her skin color. This is wise beyond a twelve year old's years and also ahead of her time for the south during the Jim Crow era. McCullers lived some of her adult life in New York and may have been influenced by northern life. As a result, she has inserted forward thinking characters into a largely backward thinking southern town. While the two do not entirely mesh, McCullers has spun a soothing, southern tale that takes readers back to simpler times. My friends in this buddy read listened to an audio version narrated by Susan Sarandon. While I did not have the audio on hand, I envisioned how Sarandon would speak various portions of the novel, adding an extra layer to the beauty of this book. Although I still have not read McCullers' definitive work, I thoroughly enjoyed The Member of the Wedding. This novel allowed me to end my reading year on a positive note as I enjoyed my time with this classic southern author and made for compelling discussions in our small buddy read group. While McCullers' other novels do not feature Frankie Addams, I am looking forward to spending more time with this gifted novelist in the years to come. Listening to Susan Sarandon was as delicious a cuppa warm hot cocoa with baby marshmallows—her voice was comforting -soothing & cozy. It was wonderful to enjoy Carson McCullers writing again. This is a beautiful and sad story told through the eyes of a 12 year old girl - who doesn’t feel as if she fits right in her own skin. She wishes to belong to a couple after their wedding. Frankie is a vulnerable innocent - I worried for her the path she was about to take. I never saw the movie...but now I want to. This classic book was a gem that I purchased on an audible daily special sale. Themes of loneliness, racial issues, war, and anxiety run through the novel. 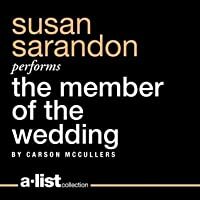 At times mesmerizing between the gorgeous writing and Sarandon’s voice. 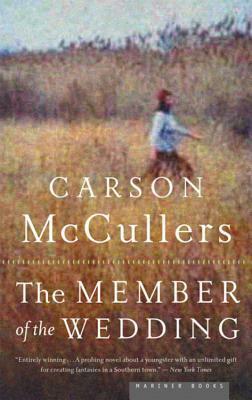 Carson McCuller's The Member of the Wedding is my unrequited love story in my stable of hos: those lyrically intimate classical works I've read that stayed with me because they were confiders of sorts, someones I could go to and find some sort of explanation inside, a relating that was more than good enough of itself. (And I get my belt when they don't put out for me.) (I don't wanna say cathartic because this book isn't like that. It's often uncomfortably painful in the don't-wanna-be-reminded- Carson McCuller's The Member of the Wedding is my unrequited love story in my stable of hos: those lyrically intimate classical works I've read that stayed with me because they were confiders of sorts, someones I could go to and find some sort of explanation inside, a relating that was more than good enough of itself. (And I get my belt when they don't put out for me.) (I don't wanna say cathartic because this book isn't like that. It's often uncomfortably painful in the don't-wanna-be-reminded-of-that-wasn't-I-reading-to-forget-that-in-the-first-place way.) I collected them, books like Betty Smith's A Tree Grows in Brooklyn, and Salinger's The Catcher in the Rye, and held them in reserve when it got to be too much. A lot of my frames of reference in experience are heavily tied into these stories. Yeah, I was angsty at times (coughs). I'm really still doing that confusion thing (ahem), and what I read tomorrow could end up sticking with me for the rest of my days. Still, I've yet to read anything else that quite stands out to me as much when I think about unrequited love. Not the love you can sustain on your own, but the emptiness inside that needs another half to become whole. Frankie is worried about herself because there's that part missing she doesn't even know how to fill. Young Frankie is the girl throwing all of her hopes onto one thing, although the chance of it working out well are none (why would her brother and his new wife take her with them after their wedding? Doesn't she know only babies and cute puppies get adopted? Doesn't matter, it could stand in for any impossible dream). I could relate to that feeling of constantly doing the wrong thing, constantly looking in the wrong places. I can't forget about her desperation. It wasn't do what you gotta do bravery, but last chances sickness. I love Carson McCullers for capturing so well that raw feeling of clinging to make believe. The especially hard times when the weight of it becomes too much. The moments in life when the usual getting by is no longer enough... I read this for the first time when I was fourteen and then again in 2007. Both times it provoked strong feelings in me. P.s. I heart Bernice. I'd have loved to have had those kitchen conversations with her. Because of her this is not a useless feel-bad book but a helps over the rough times book. Like a great conversation when all you'd had was droning voices. She was afraid of these things that made her suddenly wonder who she was, and what she was going to be in the world, and why she was standing at that minute, seeing a light, or listening, or staring up into the sky: alone. I read a lot about loneliness. Overwhelmingly, the books that I gravitate towards seem to have at least some thread of loneliness. But this...this didn't just deal with loneliness, this was trying to explain absolute aloneness. That completely exposed and silent and almost pani She was afraid of these things that made her suddenly wonder who she was, and what she was going to be in the world, and why she was standing at that minute, seeing a light, or listening, or staring up into the sky: alone. I read a lot about loneliness. Overwhelmingly, the books that I gravitate towards seem to have at least some thread of loneliness. But this...this didn't just deal with loneliness, this was trying to explain absolute aloneness. That completely exposed and silent and almost panicked feeling of being just you, by yourself, in a world full of “we,” part of nothing and no one. I was a child who was alone a lot, and there were passages in here that were painfully realistic to me. So many dusks in darkened backyards with the distant sounds of people’s dishes clinking, a dog barking, other kid's voices, and maybe a faraway radio or car horn, and none of it is yours. This little girl narrator stood around, walked around, sat around. She wanted out. She needed someone, almost anyone. She looked up from the twilight into lighted house windows and peered into doorways, searching. She was selfish and mean with flashes of anger, but that anger made so much sense to me. She’s stuck and we’re all stuck, and damned if I of all people don’t know just how futile it can turn out to be to leave a place and start over and find that distant dog barks and car horns are everywhere, especially at dusk. This book surprised me. I liked it more than Lonely Hunter, perhaps because I related to it on a deeper level, but even the writing felt more intimate to me, more tortured and dreamy and in parts, philosophical. As others have pointed out, the ending feels oddly tacked-on and almost ruins the perfect tension in the first 90% of the book. Almost. Have you ever picked up a book you are certain you have read before and found that nothing feels familiar on reading it again. Of course the first time I read it was for a college course in 1967 so there may be a valid reason aside from lost brain cells...simple time or perhaps short cuts for class. But when I reached almost the very end of the book, one plot point did seem familiar and now my doubts about truly having read it are gone. As for the book itself, Frankie/ F. Jasmine/ Frances is a wo Have you ever picked up a book you are certain you have read before and found that nothing feels familiar on reading it again. Of course the first time I read it was for a college course in 1967 so there may be a valid reason aside from lost brain cells...simple time or perhaps short cuts for class. But when I reached almost the very end of the book, one plot point did seem familiar and now my doubts about truly having read it are gone. As for the book itself, Frankie/ F. Jasmine/ Frances is a wonderful creation. Twelve, going on forever, she is struggling to understand who she is, what her world is and where she belongs in the world as a very large whole. Over the course of a few days, and followed by a short coda, we watch her fight with herself, her family, her housekeeper who is more than that, almost the whole town as she wages the battle with growing up. Of course she doesn't know what the battle is and that is one of the beauties of this novel...Frankie's inability to articulate even to herself what is wrong. She has one demand/desire: to go away with her brother and his new bride after the wedding. To escape her life. Everyone else knows what the outcome of that demand will be. There are episodes of beautiful prose throughout the novel that capture memories of summer and heat so well. whir of a lawnmower from a yard somewhere. This reminds me of summers of my childhood. The only stylistic negative for me, and this may be personal nitpicking, was the degree of repetitiveness in parts of the storytelling. For me at times the story stood a bit still. Then at some point the forward movement picked up and did not stop (even when Frankie continued to be in the kitchen with Berenice). I'd imagine the word 'universal' gets thrown around a lot in regards to this work. The temptation of it is exactly why I am excising it from my vocabulary, for even the small amount of literature I've read in the culverts of unacknowledged canon were enough to show the lie of the word. I find an immense amount of resonance in this work, resonance structured on a foundation of tokenism, sentimentality, and other measures of self-willed isolation commonly shared with other white people works of 'u I'd imagine the word 'universal' gets thrown around a lot in regards to this work. The temptation of it is exactly why I am excising it from my vocabulary, for even the small amount of literature I've read in the culverts of unacknowledged canon were enough to show the lie of the word. I find an immense amount of resonance in this work, resonance structured on a foundation of tokenism, sentimentality, and other measures of self-willed isolation commonly shared with other white people works of 'universal' meaning. I do not claim that works such as Cities of Salt or Almanac of the Dead do not rely on the same dynamics of self vs other, but no one would think to call them universal. That epithet requires power, and the world at large is not of a mind to grant them that. How much does the cult of US American childhood play a part in letting millions of white parents sleep at night? Boys will be boys, girls will be sugar and sweet, and every excuse will be made when a troubled teenage soul slaughters their propagators with gun in hand. I wonder how many condemned Frankie's father for letting her roam rather than the systematic excision of her mind from her body by the mores of society. There are the usual excuses: lack of mother, lack of white female friends of a common age, the lack of urban space commonly put as the ultimate solution by the North and the South. As per usual, McCullers comes much closer to the heart of it than most who try their hand at the metaphysics of growing up, but the threat society places on the body of a young white girl is still centered around that fact of whiteness. Frankie is a white girl who lives in a small Southern town and dreams of Alaska. She is twelve years old and in the throes of unbelonging. Her father has told her she’s too old to sleep in his bed, her age mates have formed groups that don’t include her, and her only day-to-day company is her six-year old cousin John Henry and middle-aged Berenice who keeps house. Her much older brother visits home with his fiancee and then goes away again to complete the wedding preparations. Frankie, who will Frankie is a white girl who lives in a small Southern town and dreams of Alaska. She is twelve years old and in the throes of unbelonging. Her father has told her she’s too old to sleep in his bed, her age mates have formed groups that don’t include her, and her only day-to-day company is her six-year old cousin John Henry and middle-aged Berenice who keeps house. Her much older brother visits home with his fiancee and then goes away again to complete the wedding preparations. Frankie, who will attend the wedding, is intensely captivated by the event to come, to the point of obsession. Carson McCullers, being a genius, renders this banal situation with the nightmare texture of an agonised crisis of becoming. Frankie’s unheimlich experience of her ordinary, monotonous life seems perpetually liminal. Even when she joyously enters the centre, connecting with all around her through the bridge of the wedding (at last a part of her life that others can relate to, a generic topic), she strays to the unsafe edges, she exaggerates, she lies. Frankie is an unlikeable protagonist; she is awkward, self-centred and selfish, gloomy, given to melodrama, unfeeling and sometimes manipulative towards others. I recognise her totally and terribly. I was just like this when I was twelve years old. And I swear I’ve never felt that about a literary tween, or if I have I was kidding myself. The honesty of the portrait hurts as Frankie hurts. I never stopped loving her and praying* for her to be safe and get through the fearful time, however horrible she was, because she was real to me, her pain was real. This is what it’s really like, I constantly felt. The relationships and interactions between Frankie and Berenice and John Henry are central. John Henry is as convincing a character as Frankie. Often he is more sympathetic: when Frankie uses him (to relieve her loneliness) or mistreats him, when he longs to go out and play with the other children. Unlike Frankie his sense of himself is healthy, but like her he is at different times both nice and cruel to her in his childish ways. Berenice, a black woman who has been married several times, is sensible, straightforward, motherly up to a point. She coaxes and scolds and warns and protects Frankie, often impatient with her but never unkind and often humouring her whims. Although Frankie is not satisfied in her need for “membership” by her relationship with Berenice, she takes Berenice’s oft-repeated anecdotes and life-stories to heart, they form the basis of her meagre knowledge about romantic love and sexuality. Her empathy for Berenice, uneven and awkwardly or rudely expressed, is redeeming; she will not always be this awful awkward twelve year old. She will grow into someone capable of loving and caring for others. Lonely motherless tomboy confronting sudden adolescence, prompted by her older brother's wedding. Some similarities with "To Kill a Mocking Bird" (http://www.goodreads.com/review/show/...) - in terms of character, situation, location etc. Very evocative re hot Southern summer etc. McCullers has a very consistent voice, and yet somehow her books are distinct from each other. In particular, lyrical and more literal musical aspects to much of her writing (reflecting the fact she very nearly became a Lonely motherless tomboy confronting sudden adolescence, prompted by her older brother's wedding. Some similarities with "To Kill a Mocking Bird" (http://www.goodreads.com/review/show/...) - in terms of character, situation, location etc. Very evocative re hot Southern summer etc. McCullers has a very consistent voice, and yet somehow her books are distinct from each other. In particular, lyrical and more literal musical aspects to much of her writing (reflecting the fact she very nearly became a classical pianist). Yes, a gem! Why I found it amazing and thus worth five stars is explained below in the partial review. I will only add here a bit about the book's setting: Georgia, 1944-45. You see the world through the eyes of 12 year old Frankie, or F. Jasmine Addams. SHE, not I, will explain to you why she appropriated this name. Not only do you see the emotional turmoil of a preteen but you also get the racial tensions in the South and the tension created by the War. We know it is 1944 from the simple line t Yes, a gem! Why I found it amazing and thus worth five stars is explained below in the partial review. I will only add here a bit about the book's setting: Georgia, 1944-45. You see the world through the eyes of 12 year old Frankie, or F. Jasmine Addams. SHE, not I, will explain to you why she appropriated this name. Not only do you see the emotional turmoil of a preteen but you also get the racial tensions in the South and the tension created by the War. We know it is 1944 from the simple line that "Patton is driving the Germans out of France". One line and so much is said. No long discourses on history. Do you remember when you were caught between being a child and an adult and belonging nowhere? Alone....and the world is a scary place. The narration is fantastic; it is read slowly, with feeling, and it is easy to follow. Wonderful Southern dialect. Lend me your ear for a moment please. I consider myself pretty hard to please. For this reason I tend to prefer non-fiction because then I tell myself I will at least learn something if the writing disappoints, if the story fails. But the most stupendous books are those of fiction where the writers create a marvelous gem all from NOTHING. They create a tale from assorted words and how they string them together, their imagination and their ability to capture human emotions that we all share. So when I run into astoundingly beautiful writing, and by that I do not mean "pretty" but rather writing that speaks to us all, that has the ability to to pull us out of our own existence and allows us to share common experiences and emotions, now that is something else. THAT is what Carson McCullers does in this book. Fantastic writing. Do you remember your preteens, when you didn't feel comfortable in your own skin, when the whole world changed over night and all was frightening? Physical changes and emotional changes that throw you off balance. Do you really remember that period in your life? Here it is again captured in writing. Don't read this. Listen to it narrated by Susan Sarandon. Stunning performance. The pure magic that McCullers creates with the written word makes this worth 4 stars right off the get go. She gives us the character of Frankie or F. Jasmine who is so ready to leave 12 years behind and move forward that she is a bundle of nerves and dreams. She doesn't feel like she fits in her skin any more and is so anxious to shed it and find out who she is suppose to be. That terrible angst of adolescence, the feeling that you are suppose to be doing something else, while not quite sure y The pure magic that McCullers creates with the written word makes this worth 4 stars right off the get go. She gives us the character of Frankie or F. Jasmine who is so ready to leave 12 years behind and move forward that she is a bundle of nerves and dreams. She doesn't feel like she fits in her skin any more and is so anxious to shed it and find out who she is suppose to be. That terrible angst of adolescence, the feeling that you are suppose to be doing something else, while not quite sure you want to leave what is safe but knowing for certain that there is more for you in life. This is a true tale of one's coming of age. Standing right on the edge, knowing that once you step over you are never quite so carefree and innocent....but you so want to step into the grown up side. A time of excitement, fear and woe all mixed together. Frankie is determined to travel the world with her brother and his soon to be bride. She is ready to leave all that she knows behind and seek adventure. She feels stifled in a small town where she doesn't fit in, isn't a member of the club and her best friends are the very wise, black housekeeper Berneice and her 6 year old cousin John Henry. She laments her fate day after day as she awaits the big wedding day, but the closer it gets the more she seems to reminisce and feels a little sad about moving on. Her dreams are big but so far her world is small even though it is safe. McCullers took me into that old southern house, right up to the kitchen table eating Hoppin John, playing bridge with sticky stained cards while the flies buzzed in the thick and humid air. I could feel Frankie just bubbling over to tell anyone who would listen that she was going to leave this little town behind. I could hear the regret in Berneice's voice as she told her stories, I could feel John Henry's childish wonder at everything around him. I was drawn to this story of 12-year-old Frankie, who is restless and fearful and jealous of anyone who is happy, because she is such a jumble of adolescent angst. "This was the summer when Frankie was sick and tired of being Frankie. She hated herself, and had become a loafer and a big no-good who hung around the summer kitchen ... The war and the world were too fast and big and strange. To think about the world for very long made her afraid. She was not afraid of Germans or bombs or Japanese. I was drawn to this story of 12-year-old Frankie, who is restless and fearful and jealous of anyone who is happy, because she is such a jumble of adolescent angst. "This was the summer when Frankie was sick and tired of being Frankie. She hated herself, and had become a loafer and a big no-good who hung around the summer kitchen ... The war and the world were too fast and big and strange. To think about the world for very long made her afraid. She was not afraid of Germans or bombs or Japanese. She was afraid because in the war they would not include her, and because the world seemed somehow separate from herself." When it is announced that her brother is getting married, Frankie becomes obsessed with the idea of leaving home and going to live with him and his new bride. "I love the two of them so much. We'll go to every place together. It's like I've known it all my life, that I belong to be with them." The family cook, Berenice, tries to talk sense into Frankie, but she won't listen. Meanwhile, Frankie walks all over town telling everyone she meets that she's going to a wedding and then moving away, and she bosses around her young cousin, John Henry. The story builds until the weekend of the wedding, the outcome of which I will not spoil. This is the second Carson McCullers book I've read this year, the other being "The Ballad of the Sad Cafe," and I like her writing so much I plan to finish out her oeuvre. The book was published in 1947 and I was worried that the story might be outdated. But no, a really well written story, very disturbing, about young motherless girl (12 years old) brought up mostly by the black cook, Bernice. Her widowed father was also present but was fairly busy with his own job. The girl was fairly grown up for her age, had her own fantasies and wanted to belong somewhere else or even to run away from her home. I recommend this book to all the people who have What a great book! I recommend this book to all the people who have young children. When I was a little younger than the main character of this story, I had a recurring nightmare. In the dream I would wake up and find everyone in my family changed. Sometimes they were monsters or sometimes they were just someone else’s family. They didn’t know me and I didn’t belong anymore. It was terrifying. The Member of the Wedding explores that need to belong. It brought back to me in vivid detail what it was like to be 12. There are many stories that talk about that awkward age, but most give me the strong feeling that they’re told from the future looking back. This is it in the moment. Looking back, I can think of it as a transitional period, as confusion. But in the moment there is just exactly what is happening to Frankie in this story. She is impulsive. She is fervent. And she can’t find a satisfying explanation for any of it. I remember this. Carson McCullers’ writing is extremely evocative. I could get drunk on her words. Below are just two examples. I can’t wait to read more of her work. It’s like chocolate—one piece just leaves me wanting more. Carson McCullers was an author who used her writing to search for God and to explore her own questions about sexual identity. In The Member of the Wedding her main character, who is called Frankie, turns 12 and begins to try to figure out how she is going to navigate her way around this big old lonely world. Will she do it with a “crew-cut”, wearing a Mexican hat and with “rusty elbows”, or will she seek adventure in exotic places with “Esquimaux” by train in silver slippers with her hair in cur Carson McCullers was an author who used her writing to search for God and to explore her own questions about sexual identity. In The Member of the Wedding her main character, who is called Frankie, turns 12 and begins to try to figure out how she is going to navigate her way around this big old lonely world. Will she do it with a “crew-cut”, wearing a Mexican hat and with “rusty elbows”, or will she seek adventure in exotic places with “Esquimaux” by train in silver slippers with her hair in curls going by the name of F. Jasmine on the arm of a soldier? Frankie does not belong to any “we”. The neighborhood girls won’t let her join their club and the only people she ever talks with are her housekeeper Bernice and her distant cousin, John Henry; John Henry who follows F. Jasmine around the town wearing her jonquil dress, one of the “costumes” that Frankie has given to him. McCullers’ Southern Gothic novel is a coming of age story – but this is the coming of age story of a misfit who throws knives at her housekeeper, steals knives from the local Sears and Roebuck Store and also steals her father’s pistol and shoots up all the cartridges in a vacant lot. She is growing up in the time of WWII, never knowing her mother who died the day Frankie was born. She is being raised by her tired, widowed father and Bernice, their black housekeeper who dreams of a world where there is “no separate colored people in the world, but all human beings (are) light brown color with blue eyes and black hair. There would be no colored people and no white people to make the colored people feel cheap and sorry all through their lives. No colored people, but all human men and ladies and children as one loving family on the earth.” Bernice also dreams of finding a new man who makes her "shiver." Frankie is on the brink of sexual and emotional discovery – and the rest of the world is also struggling with racial conflict and the horrors and disruption of war. Frankie tem doze anos. É órfã de mãe - que morreu quando ela nasceu - e o pai... tem a vida dele. Uma grande parte do seu tempo é passado na cozinha, tendo por companhia uma empregada (uma negra de quarenta anos) e um primo com seis anos, com os quais tem longas conversas. Os seus dias são feitos de desassossego interior e vagueia pela cidade, observando coisas em que dantes não reparava e "tinha medo destas coisas que de súbito a faziam perguntar-se quem era, qual seria o seu lugar no mundo, e por que estava ali naquele minuto, vendo uma luz, ou escutando, ou de olhos fitos no céu: sozinha. Tinha medo e sentia um aperto esquisito no peito." Quando recebe a notícia de que o irmão vai casar, F. Jasmine começa a sonhar: fazer-se "sócia do casamento" e partir com o casal; libertar-se daquele lugar onde nada acontece. Frankie is feeling lonely, and isolated in this coming-of-age story: "It happened that green and crazy summer when Frankie was twelve years old. This was the summer when for a long time she had not been a member. She belonged to no club and was a member of nothing in the world. Frankie had become an unjoined person who hung around doorways, and she was afraid." Her mother died when Frankie was born, her father is distant, and her best friend moved away. Frankie wonders if she might turn into a f Frankie is feeling lonely, and isolated in this coming-of-age story: "It happened that green and crazy summer when Frankie was twelve years old. This was the summer when for a long time she had not been a member. She belonged to no club and was a member of nothing in the world. Frankie had become an unjoined person who hung around doorways, and she was afraid." Her mother died when Frankie was born, her father is distant, and her best friend moved away. Frankie wonders if she might turn into a freak because she is at a gangly, awkward stage. Her wish to belong to a group is so strong that she comes up with the idea of going away with her brother and his bride after their wedding. The story also shows Carson McCullers' concern for other individuals that are excluded because they are different. Bernice, the African American maid, tells how difficult it is having dark skin. Frankie, who is a tomboy, wishes that people could switch back and forth from being boys to girls. Her cousin, John Henry, wants people to be "half boy and half girl." Sad Cafe, Golden Eye, Lonely Hunter - it is bold to say it, but this, could well be my favourite of all. Twelve year old Frankie is Lonely Hunters Mick Kelly at a fever pitch. She's like a tornado of pain, trying to tear her young self out. What makes this novel brilliant though: Frankie, Berenice and John Henry in that dingy kitchen, talking large over hoppingjohn, corn bread and ham from the knuckle. Rolling eternal thoughts among them like dice and landing on crazy. You have to read it to see how beautiful that is. The New York Times say in large print 'Rarely has emotional turbulence been so delicately conveyed'. Delicately? No. There's nothing delicate here. I'm really disappointed. I thought I'd love this, but I didn't even like it. The story dragged, it was boring and it irritated me. I skimmed the last half just to get it over and done with. I didn't like any of the characters, not even Berenice. I found Frankie obnoxious, and wanted nothing more than to box her ears. Reading it was a chore! "I wish I was somebody else except me." I've seen several pictures of Carson McCullers smiling, but I can tell she was a sad, sad person. Her characters tend to be this way: lonely, sad, at their wit's end of life; she writes about what she knows. I favor this more than 'The Heart is a Lonely Hunter', although I do respect it for it being her first novel. i don't think i've read a more beautiful book. 12-year-old Frankie is a misfit in her small Georgia town. Her widower father is largely absent from the home and her brother Jarvis has been stationed in far away Alaska. Her only friends are the house maid Berenice and her 6-year-old cousin John Henry. She’s restless at an age where everything is about to change though she has no idea how or why, as her father and Berenice have provided no guidance. When Frankie learns her brother is returning to marry a woman named Janice in nearby Winter Hill 12-year-old Frankie is a misfit in her small Georgia town. Her widower father is largely absent from the home and her brother Jarvis has been stationed in far away Alaska. Her only friends are the house maid Berenice and her 6-year-old cousin John Henry. When Frankie learns her brother is returning to marry a woman named Janice in nearby Winter Hill, her life begins to center around the wedding. With little attention from the people in her life, she dreams that Jarvis and Janice will take her to live with them after their wedding. This dream turns to undoubted truth as she wanders her small town telling everyone she meets about the upcoming nuptials. Frankie even begins to call herself Jasmine, a name beginning with the same letters as both her brother and his fiancee, hoping for further acceptance from them. After announcing she will not be returning home from Winter Hill but will instead leave with Jarvis and his bride, Frankie’s father seems unmoved and Berenice waves off the talk as the ridiculous dreams of a child, though neither will explain why it is an impossibility or tell her that she is wanted/needed at home. With little supervision, Frankie continues to wander town and finds herself innocently flirting with a solider who believes her older than her 12 years. Enjoying the attention leads Frankie into a potentially dangerous situation that she doesn’t understand. This story is so subtle yet powerfully written, highlighting the intense need to fit in and find one’s place in the world, the desire for love and attention, and the childhood power of believing in something so strongly that it becomes truth. The characters and their relationships, especially Frankie and Berenice, are all richly developed and complex, offering an insightful glimpse into the 1940’s South and the end of childhood. Frankie manages to be innocent and oblivious while at the same time unforgiving and wise beyond her years. The conversations she has around the table with Berenice and John Henry are full of emotion and her home life is enough to break my heart. Berenice is a mother-figure to Frankie and yet I was devastated at how she held back so much in their relationship because of her place in the household and in the Jim Crow South as a whole. It was yet another deep layer in their relationship that captured me. McCullers has given us an exceptional story that most everyone can relate to and created strong characters that are sure to resonate with me for a long time to come. I look forward to reading more of her contributions to Southern literature. Frankie Addams is 12 and feels like she doesn't fit in. Physically she may have a point - tall for her age she towers above her peers and this compounds the natural anxiety of adolescence. She never knew her mother, her best friend has moved away - even her precious cat has gone missing. And now her brother is to be married and she is jealous. The Member of the Wedding concerns Frankie's feelings about this impending wedding and how she deals with it when it does, in fact, go ahead. We learn abo Frankie Addams is 12 and feels like she doesn't fit in. Physically she may have a point - tall for her age she towers above her peers and this compounds the natural anxiety of adolescence. She never knew her mother, her best friend has moved away - even her precious cat has gone missing. And now her brother is to be married and she is jealous. The Member of the Wedding concerns Frankie's feelings about this impending wedding and how she deals with it when it does, in fact, go ahead. We learn about much of this from her discussions with Berenice - her father's housekeeper who appears to be her substitute mother. This is a very atmospheric novel. You can practically reach out and touch Frankie's frustration at times. The descriptions are sublime and I felt that the time and place were evoked so well that one could readily imagine oneself there as one of the characters involved. That happens rarely, in my opinion. Such a vivid, cruel when necessary, and yet unhysterical account of a 12 & 5/6th year old girl. She's filled with intense emotions that she doesn't have names for, eagerness, desperation. This is a book that describes how it feels to be this person--how it feels to be a smart girl somewhere in the mush between kid and adult, engaging in adult ideas but with a child's facility. McCullers is brave, she doesn't shy away from the horror of being alive, and yet never loses her warmth. The Member of the Wedding is an authentic account of the desperate adolescent need to grow up and find a place to belong in the world. McCullers writes about the frustrations of childhood with great clarity, and her prose is compassionate and sincere. While I really enjoyed seeing the world through Frankie's eyes, I think this book would have resonated much more, had I read it when I was younger.